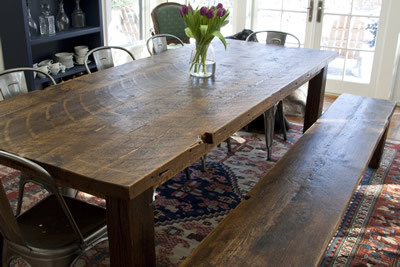 Vanderbilt Harvest table, crafted with traditional hand tools using Southern Yellow Pine rafters and beams circa late 1700 from the Vanderbilt family stable at Sandy Point Farm, Portsmouth, RI. Purchased in 1902 by Reginald Vanderbilt (steamship and New York Railroad magnate), Sandy Point Farm became one of the pre-eminent horse breeding farms in the country. Custom sizes up to 13 ft long. Vanderbilt Table Recently Featured in House Beautiful Magazine.